Fire rescue crews responded to a vehicle crash involving a semi tractor / trailer and several passenger vehicles around 1:00 p.m. on Tuesday, August 29, 2017. 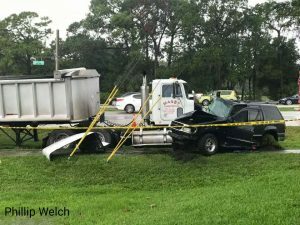 The crash occurred at the intersection of East Lake Road and Ridgemoor Boulevard. 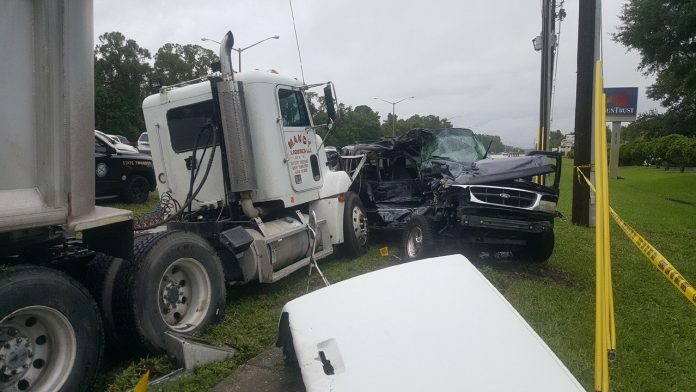 According to the Florida Highway Patrol, 60 year-old Moses Lopez of Brandon was traveling northbound on East Lake Road in a semi tractor / trailer. Lopez failed to stop for a red traffic signal and collided with a 2000 Ford Explorer. The driver of the Explorer, 32 year-old Jeffrey Diedrich of New Port Richey, was traveling southbound attempting to turn left onto Ridgemoor Drive. Following the initial collision, the vehicles traveled and struck a 2002 Toyota Sequoia. Diedrich was transported via ambulance to the trauma center at Regional Medical Center Bayonet Point due to the severity of his injuries. FHP categorized his injuries as critical. The three occupants of the Toyota were also not injured in the crash according to the report. Charges are listed as pending as the incident remains under investigation. FHP closed the northbound and eastbound lanes of the intersection during the investigation.